Difficulty Notes: Like getting slowly boiled, Potts starts off easy and ends hard and you’re not sure how it happened. 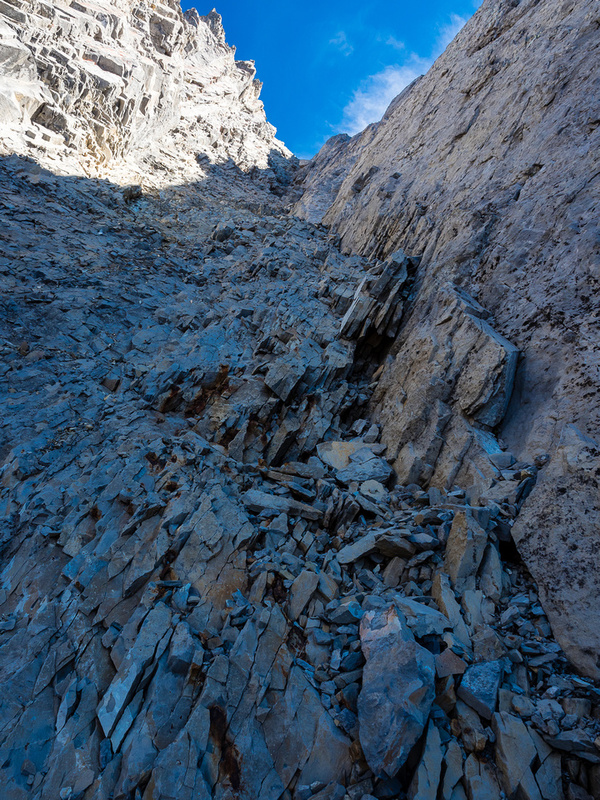 The steep, loose gully to the summit ridge is quite dangerous for rockfall and should be respected in this regard. 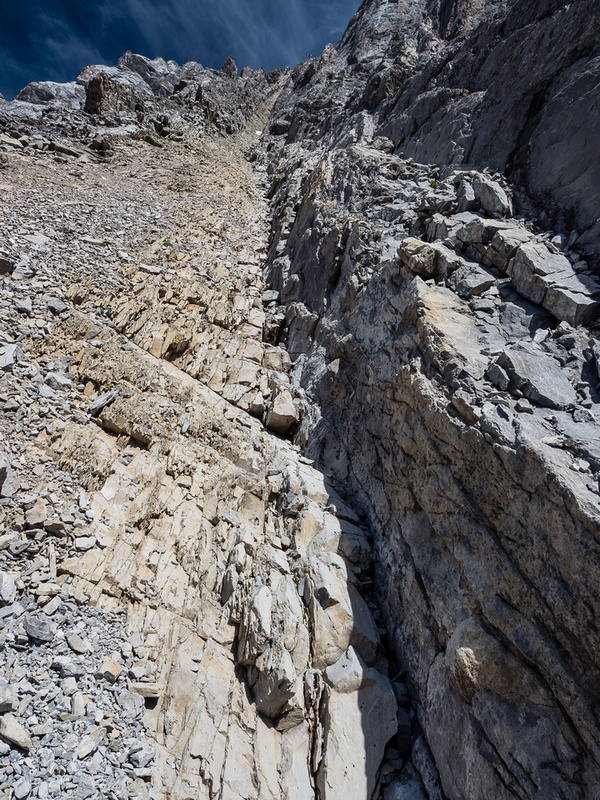 I would not go anywhere near this route with a group of more than 2 experienced scramblers. 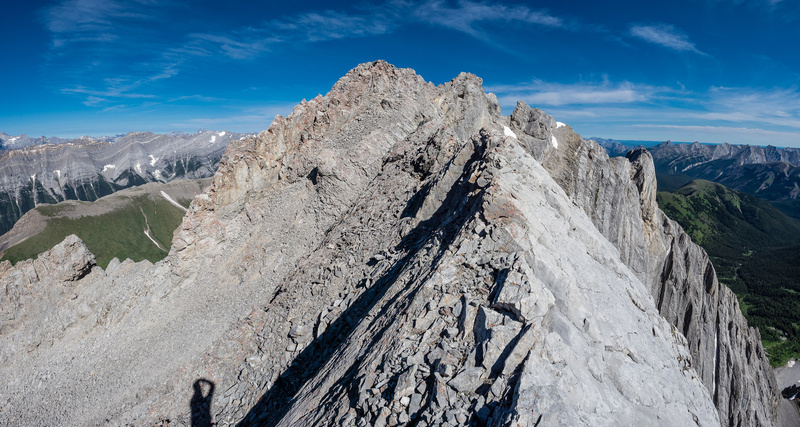 After getting a request from Grant Myers to scramble Mount Potts and also after looking at it on our approach to Mount Denny earlier in 2018, it was on my radar for an ascent at some point this year. Kane describes this peak as “much more difficult than Denny” and even suggests combining it with that peak for a long two peak day. Normally I would be very keen on a two peak day, but Mount Denny was perfect for a trip on its own and I loved the approach trail up Grizzly Creek anyway, and didn’t mind coming back. After scrambling Silverhorn Mountain solo on Friday the 13th of July and going to Canmore for supper with Phil and Manda, Hann and myself on Saturday, I wasn’t expecting to be going back yet again for another scramble on Sunday the 15th but the weather was just too nice to sit at home. I was surprised to be excited to go out again, but I found myself really looking forward to Mount Potts for some reason. I think I knew the approach was great and the mountain seemed like a perfect solo objective. Despite Kevin Barton making it sound almost “easy” – I knew from Grant who’d recently done it, that while it might not be technically advanced, the gully was dangerously loose. Grant cautioned me very strongly not to go with inexperienced people or even more than a group of two. I decided a “group” of one sounded best. The drive to the Grizzly parking lot was very pleasant in the early morning hours. There was more traffic than I expected at 05:30 though. I was hoping to beat the crazy Sunday afternoon mess that is the traffic between Canmore and Calgary the past few years – hence my early start at around 07:00 from the trailhead. 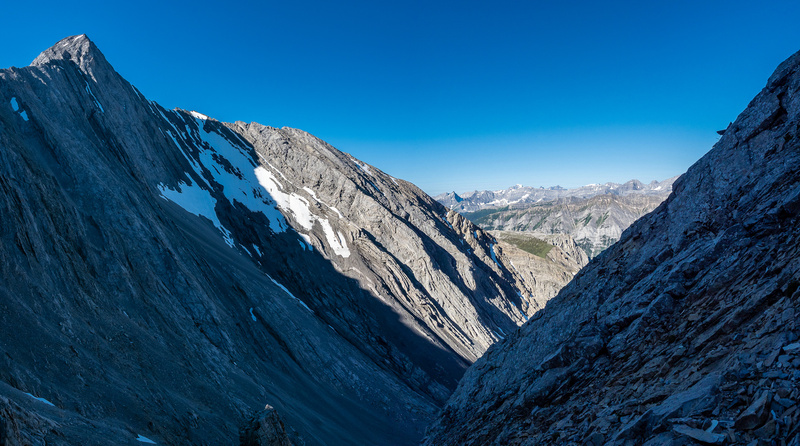 I followed the now familiar trail up climber’s left of Grizzly Creek, enjoying the direct and scenic approach to the back bowl even more than the first time I did it with Wietse only around 6 weeks previous. 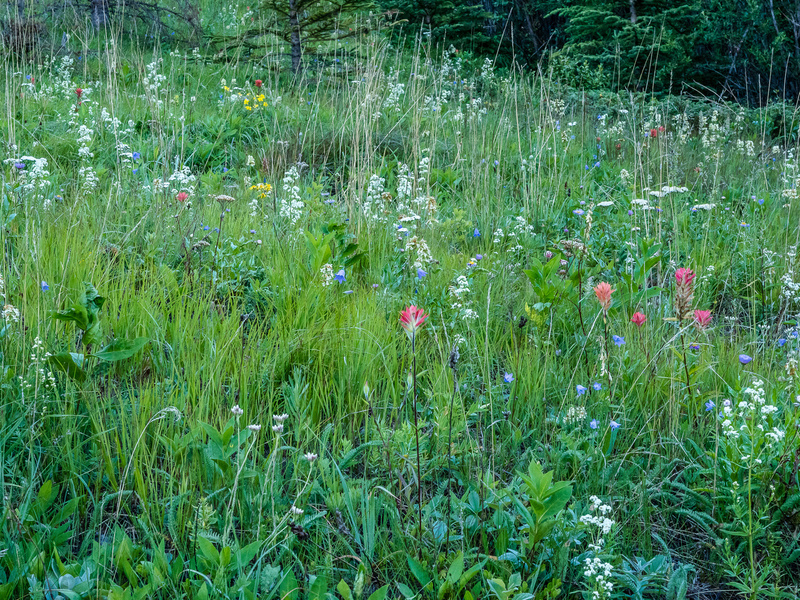 Wildflowers were out in full effect now and the morning was pleasantly cool. Within about an hour of leaving the car I was at the junction for Denny (left) or Potts (continue). 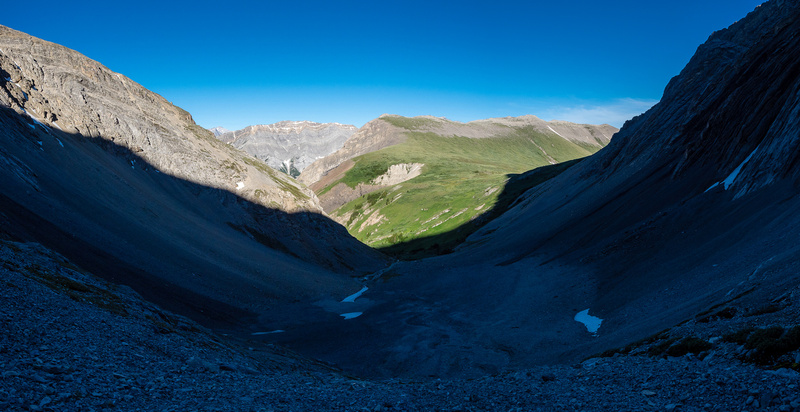 I continued straight up valley, slowly contouring south (right) into the lovely headwaters of Grizzly Creek. Something that struck me as I worked my way into the cirque between Potts and Evan Thomas was how much height I was gaining. This was awesome, as it obviously meant the gully would be shorter than expected. Grant told me the gully was much longer than it appeared from the bottom but as I scrambled to the top of the second cliff band I noted from my GPS that it couldn’t be more than a couple hundred vertical meters, if not only 150. 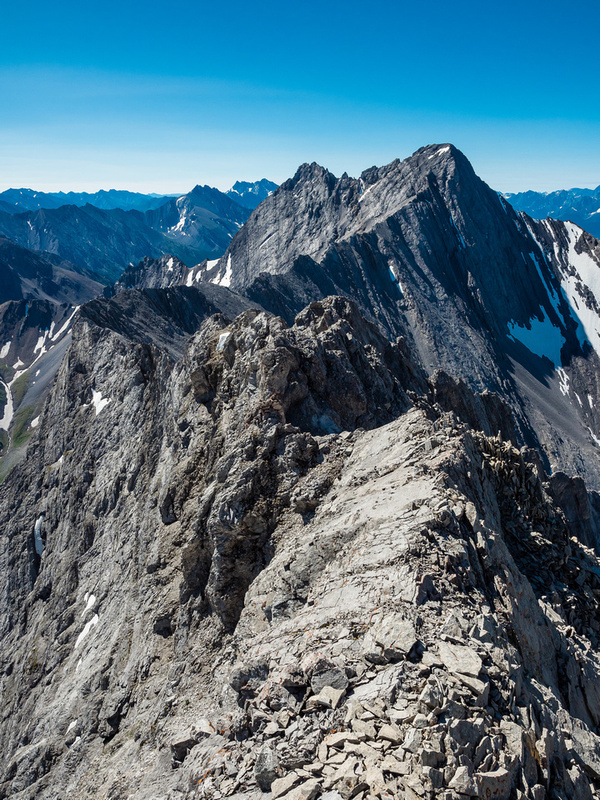 I was too high for it to be much more than that – the south end of Opal Ridge was already lower than my position. As I looked carefully at the gully I suspected was the right one (compared to a photo Grant sent me), I also noted that there’s a heckuva lot of gullies on that face! I also noted that my sense of “brown” must be off, because I could barely distinguish between the “brown” side and the “gray” side. I used landscape features, including a big stone in the gully to ensure it was the right one before starting up. One thing still puzzles me a bit about the route Grant and I took versus the route described in Kane’s book. 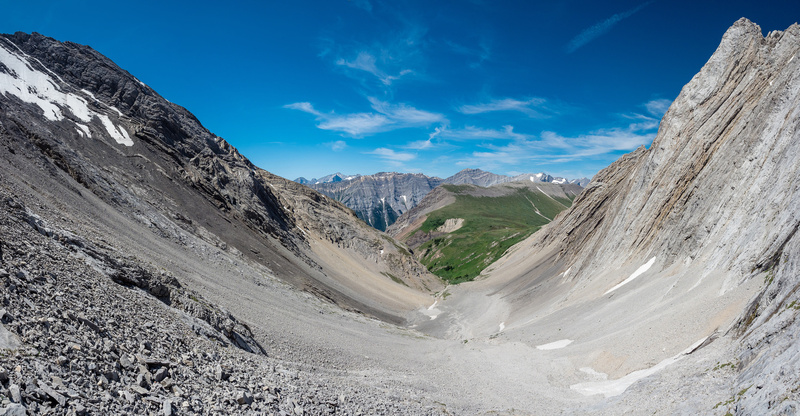 It’s very likely the same route but Kane mentions going left up a brownish shale gully after the first rock band at the back of the cirque between Evan Thomas and Potts. Grant gave me better beta. 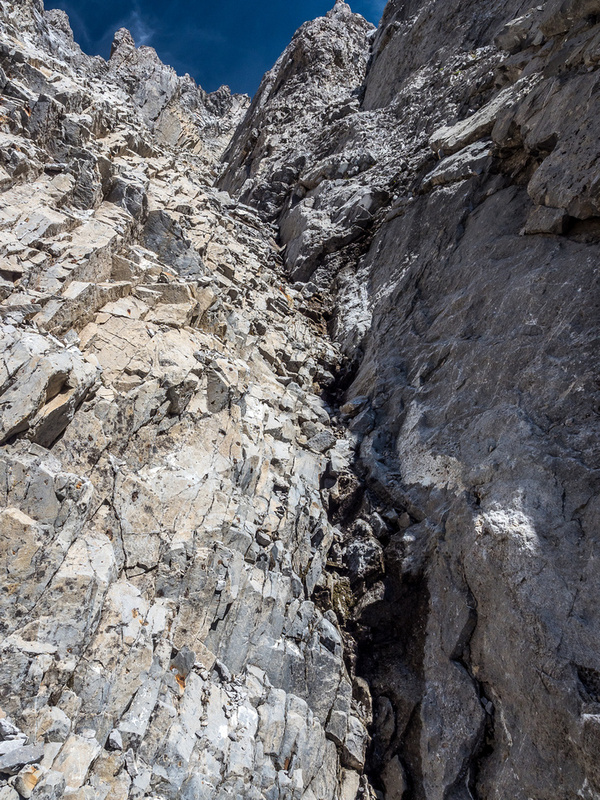 He mentioned going up two rock bands before going immediately left up a gully that was brownish on climber’s left and gray rock on climber’s right. I’m reasonably certain this is the gully Kane meant, but this extra detail will help you find it much easier. If I took Kane’s description literally, I would have ended up in a very different “brownish” gully that is immediately climber’s left of the first rock band. I don’t know if this gully would work or not, but the one I took certainly does! Mount Potts comes into view up valley. Note the light brown crumbly rock abutting the “solid” (it’s not that solid) gray rock at right. Great views back towards Evan Thomas (L). Now this sucker is getting steep! Mount Potts is a hard mountain to rate for difficulty. Being solo, I have to agree with Barton that it’s on the easier side of “difficult”. 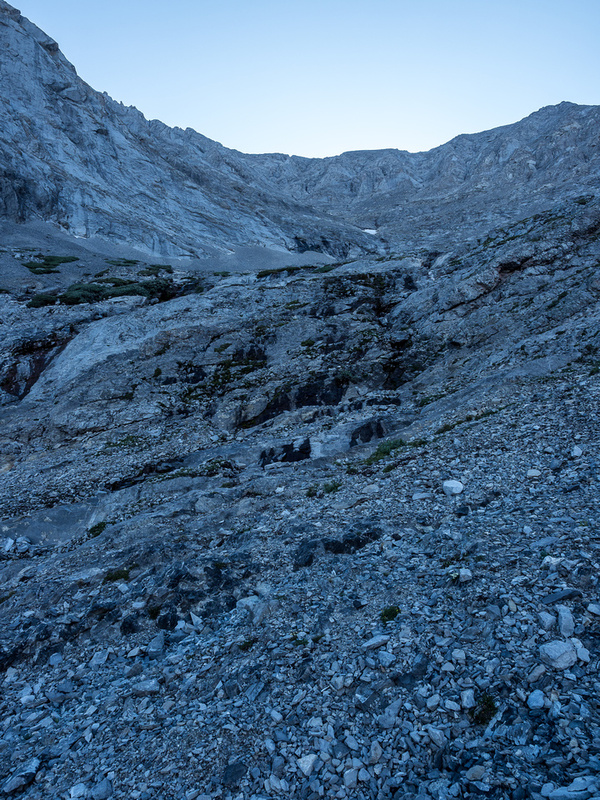 That being said, this is a terribly loose and steep gully that really only shows its teeth on the way back down it. On ascent I took my time, including some delicate moves around rock hard snow in the gully (I really wished for crampons / ax here) and some near-vertical sections. The day was perfect for scrambling and I was in the shade in the gully which was fantastic! I love tight gullies for scrambling because the exposure doesn’t feel so bad and you can do fun stemming moves off the walls to get around difficulties. This is why it’s hard for me to rate properly. The issue is that the gully is by definition a BRUTAL terrain trap! I can’t stress this enough! If you get unlucky with a gust of wind, a mountain sheep or Heaven forbid, another person above you, you could die in this gully. I’m not exaggerating. I think it was almost as loose as OXO and even more of a terrain trap. The only reason OXO is still much harder is that it involved more exposure and face climbing. 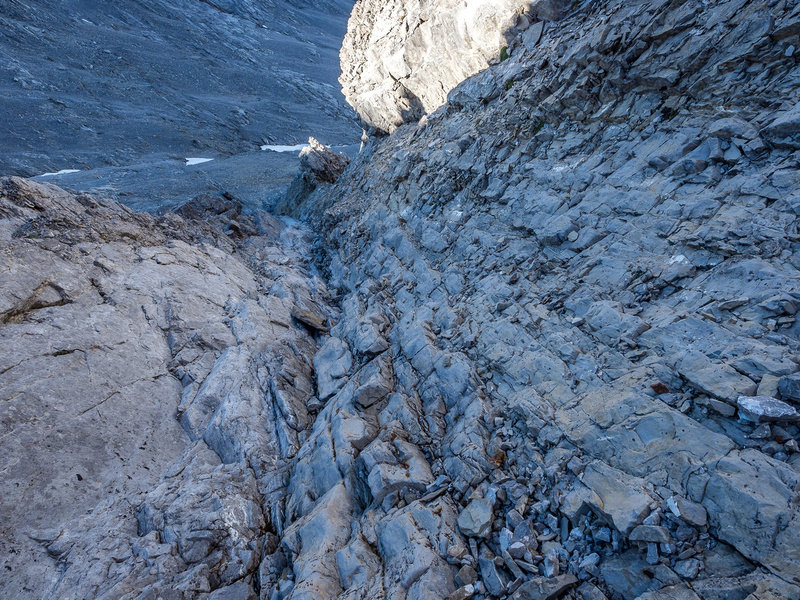 Any rockfall from above on Potts, would funnel right into your face if you were ascending when it came down. 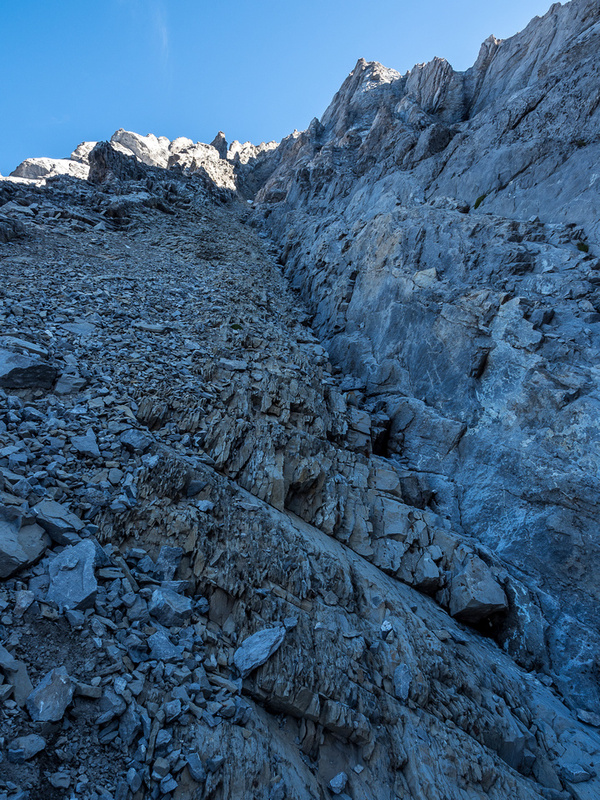 The interesting part for me is that I didn’t realize just how loose the rocks in the gully were until my descent. On ascent I didn’t kick very many down because I used the walls whenever I could and stepped very lightly. 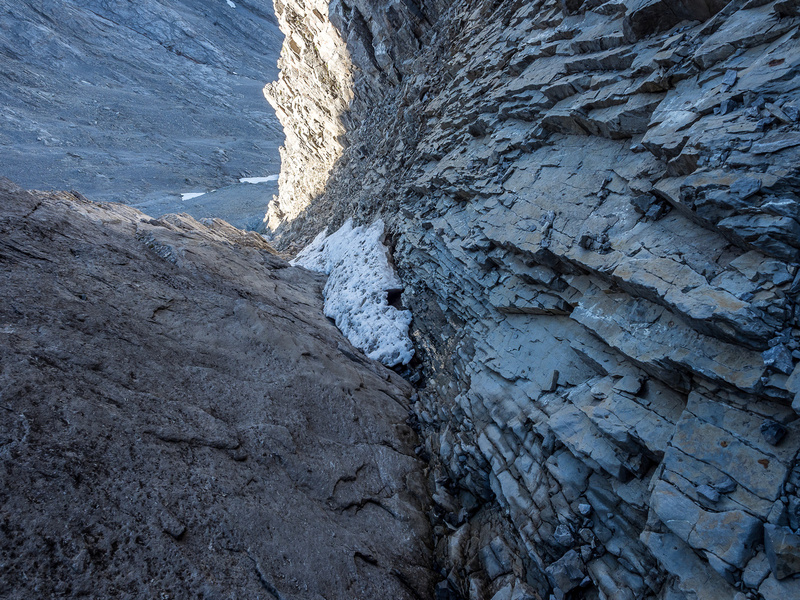 On return, gravity pulled me down and I could not avoid generating scary rock fall, especially in the upper gully that propagated all the way down it! For now I’ve rated the overall scramble as “difficult” with class three instead of four. Falling anywhere off the summit ridge would kill you, but that’s no different than other “moderate”, exposed scrambles. 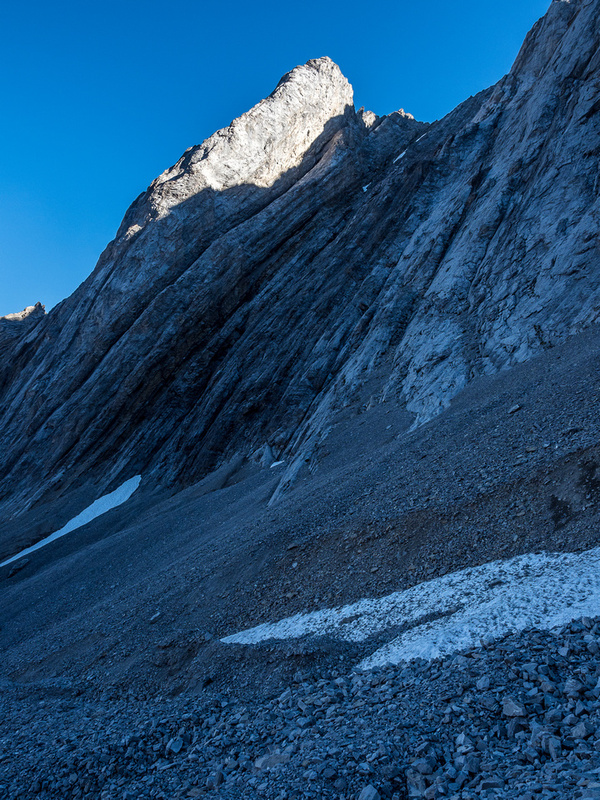 The terrain along the summit ridge is upper moderate to low difficult as some tricky moves are inevitable. As I ascended higher and higher I noted how quick and efficient the gully was for ascent. Using the more solid walls (not completely solid, however) on either side assisted me greatly. 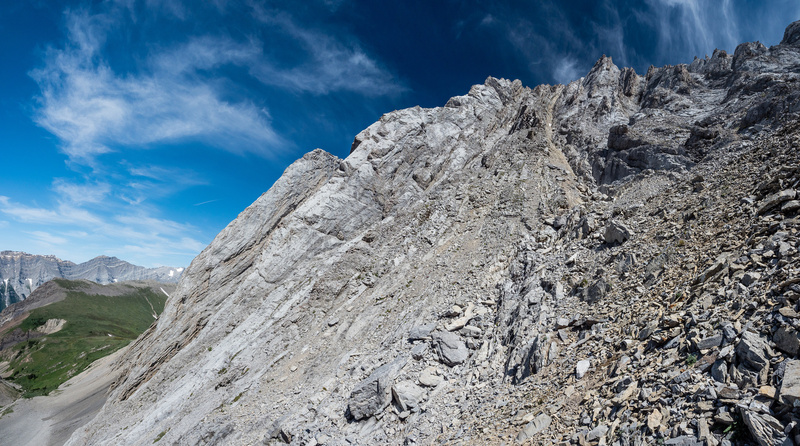 Soon enough I was staring up at the even steeper final meters of gully to the summit ridge. I kept looking back down to gauge how steep it was getting and was pleasantly surprised to note that it wasn’t too bad. The final section was very steep, but again, didn’t feel horrible. It was pretty loose, however, and I took great care to note areas of difficulty for my upcoming downclimb of this section. Much quicker than I expected, I popped out on the summit ridge to glorious views and a nice line towards the summit. As expected, the traverse to the summit was difficult and exposed scrambling, but nothing too terrible either. 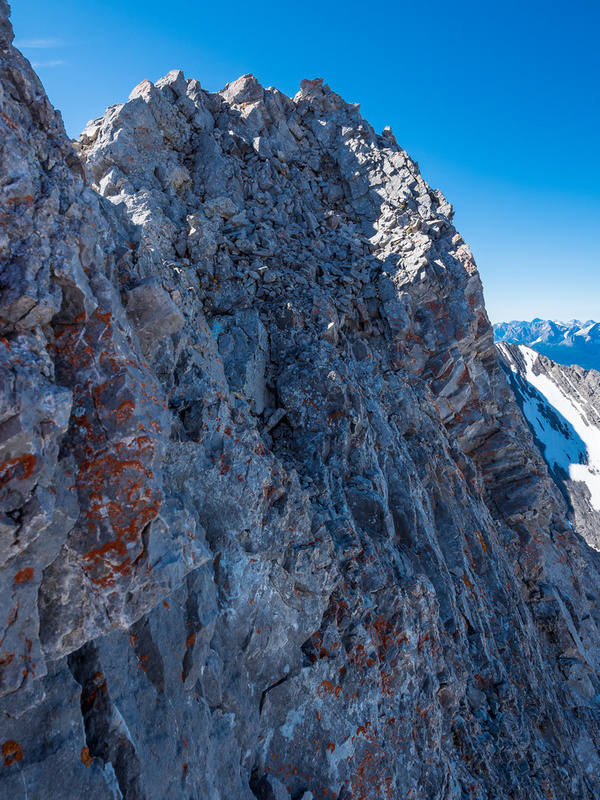 It wasn’t much harder than the exposed traverse we did on Denny to be honest – but of course on Denny you can avoid that ridge while on Potts you have no choice. One difference between Pott’s summit ridge and Denny’s, is the downclimbing along Pott’s ridge. 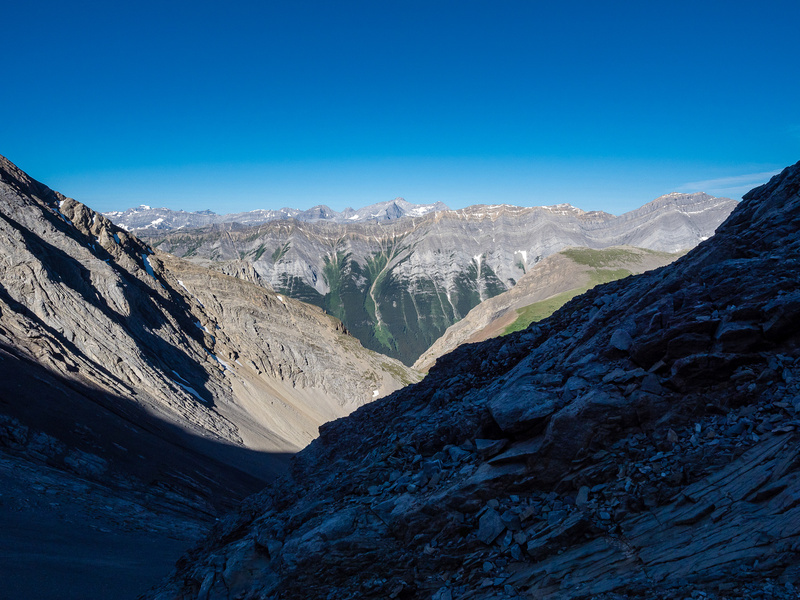 I enjoyed the exposed scrambling in the beautiful morning sunshine and cool mountain breezes. It was over too quickly and I found myself at the summit within about 3.5 hours of leaving the car – again, quicker than I expected. 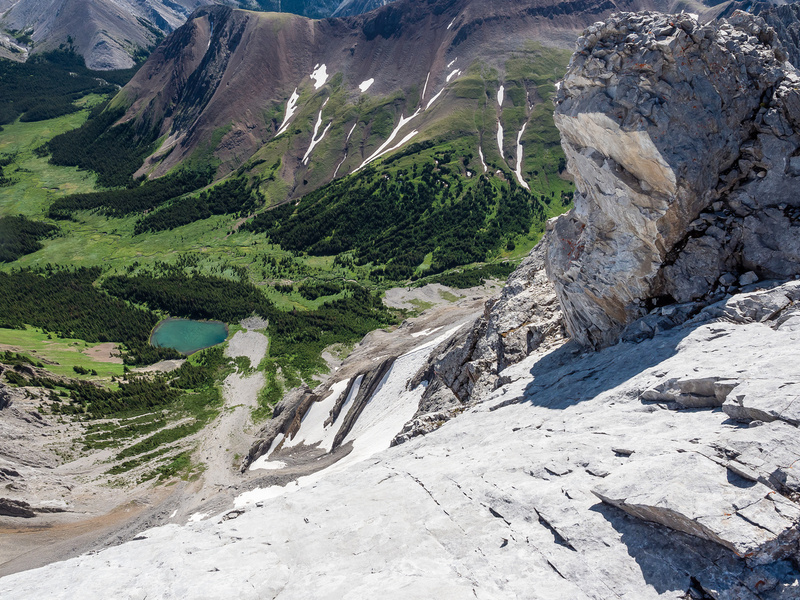 The views on Potts are similar to other Opal peaks – in other words they’re stupendous! I particularly enjoyed the views over the lush, green valley to the east which holds Evan Thomas Creek and the Evan Thomas Trail leading to Fisher Peak which is surprisingly close to Potts and Denny. After enjoying the fantastic summit in perfect weather and reading the entire summit register, first signed in 1974, it was time to go back down. On the summit ridge of Mount Potts. Not a shabby view once I pop out on the summit ridge. This is looking south towards Mount Evan Thomas. As expected, wonderful summit views north (L), east (C) and south (R) include peaks such as, Denny, Fisher, Romulus and Evan Thomas. 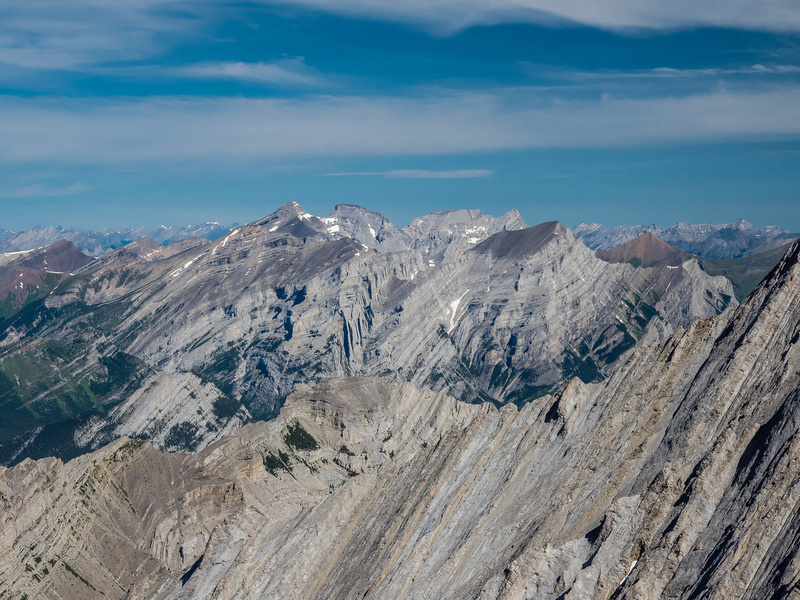 Now looking south (L), west (C) and north (R) over my approach at lower center and towards the main Kananaskis and Spray Lakes peaks including Lawson Ridge and summit at center and many others beyond. 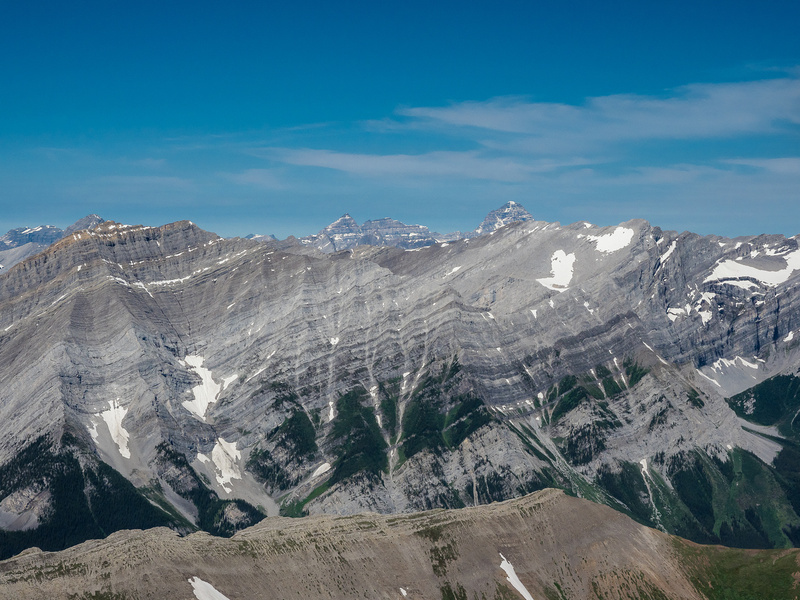 Mount Denny at right here with Opal Ridge running off to the right from mid center. 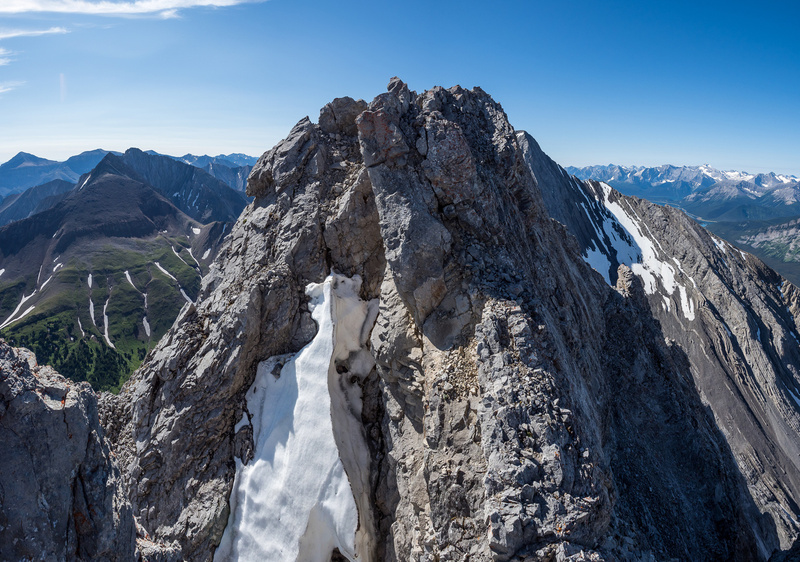 Great positions on the ridge with views to knock you off your feet (which would kill you)! Fisher Peak at left. The summit ridge was easier on return and technically the gully was no problem either. The real issue? I realized, on descending the horribly loose and steep upper gully just how dangerous this thing actually is. As long as you’re the only one in it, the gully is kind of fun. When I considered anyone else in there with me, I shuddered at the thought. I would have seriously injured or killed anyone else coming up as I started down. 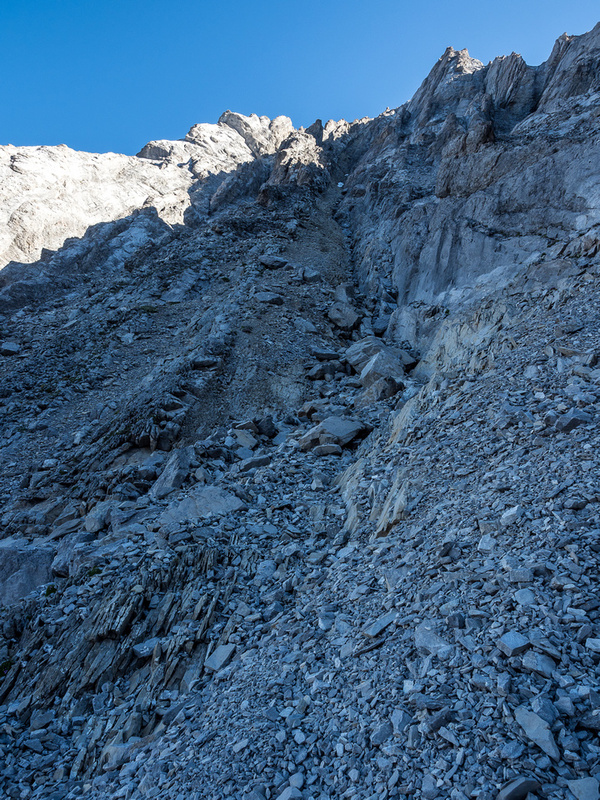 The upper gully is simply too steep and full of loose rocks to avoid kicking a few hundred of them down – and they go ALL the way down! As I descended further the gully flattened a bit and loose rock was less of an issue but I was nervously listening to the sounds of rock coming down behind me I can promise you that! I was ready at a moments notice to cower behind my pack and hope for the best if a volley of rock came down on top of me. 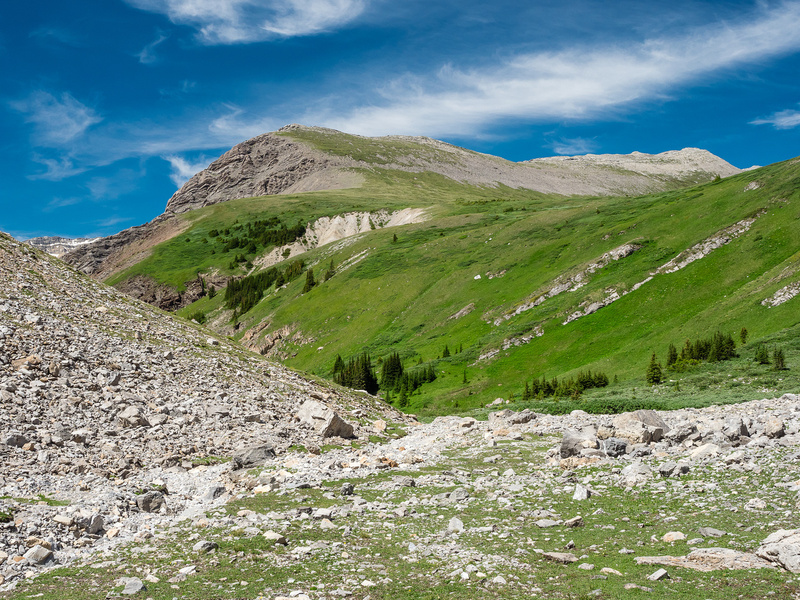 Don’t forget – I’d just loosened a whole ton of rocks before climbing delicately over and around them. A gust of wind or even just gravity could be the tiny nudge any one of hundreds of them would need to start an avalanche of pain down on me. I breathed a huge sigh of relief when I exited the bottom of that gully! 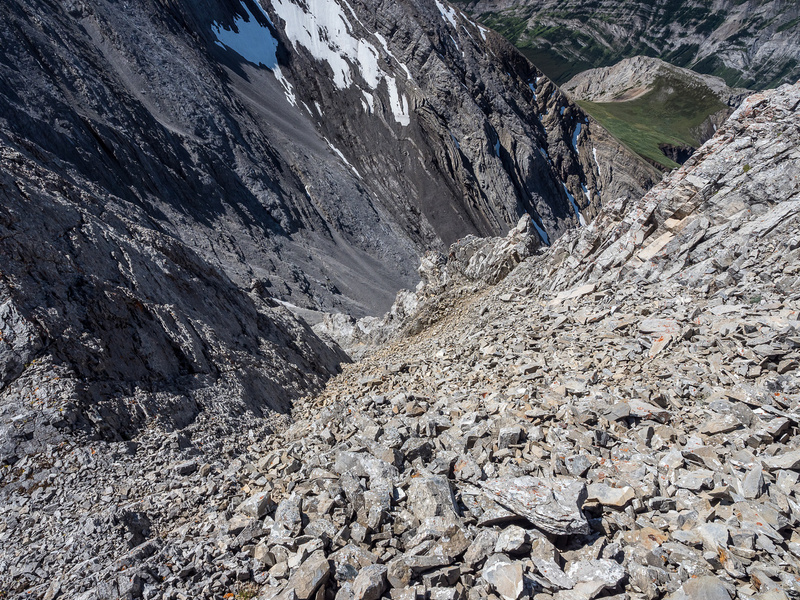 Maybe over time the loose rocks will get cleared out – which would be good because the route is a ton of fun – I really enjoyed most of it. The exit was quick and hot in the afternoon sun. Cold water never tasted so good as drinking out of Grizzly Creek at the crossing and dunking my head under the small waterfall there. I arrived back at the car within 7 hours of leaving it – apparently Potts is a fairly quick and short day which must be why Kane suggests combining it with Denny. 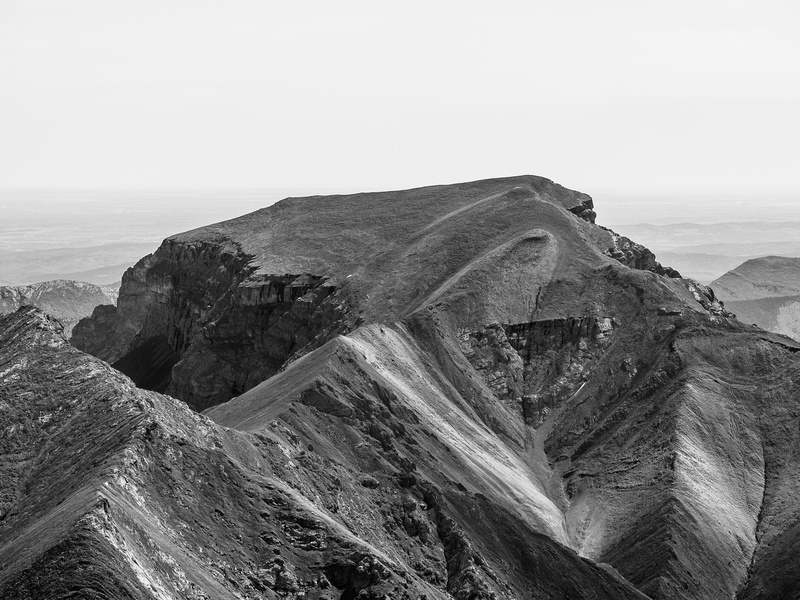 I’d recommend if you are keen on combining these two peaks, do Potts first. You want to be the first (and only) party on it and Denny will seem pretty easy in comparison – a smarter choice to do when tired from your first peak. 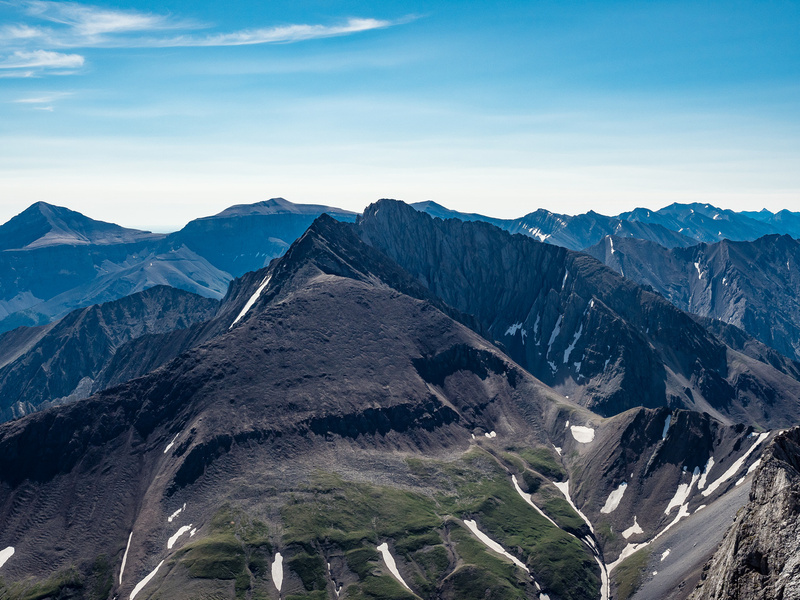 Gorgeous views off Mount Potts summit ridge. Looking out of Mount Potts exit valley. Despite the loose gully, I really enjoyed Potts and would probably rate it even a bit higher than Denny as a scramble due to its slightly more technical nature and fewer ascents. Unfortunately for me, I was once again reminded on the ride home why I’ve stopped going to the core Rockies areas on Sundays. Traffic on hwy 1 back to Calgary was absolutely horrible. Despite there being no accidents, we drove 5km/h for an hour or more just due to traffic congestion! Does everyone and their grandma HAVE to go to Canmore or Banff for brunch on Sunday?! REALLY?! EVERYONE?! There are a lot more flowers along the trail than 6 weeks ago! 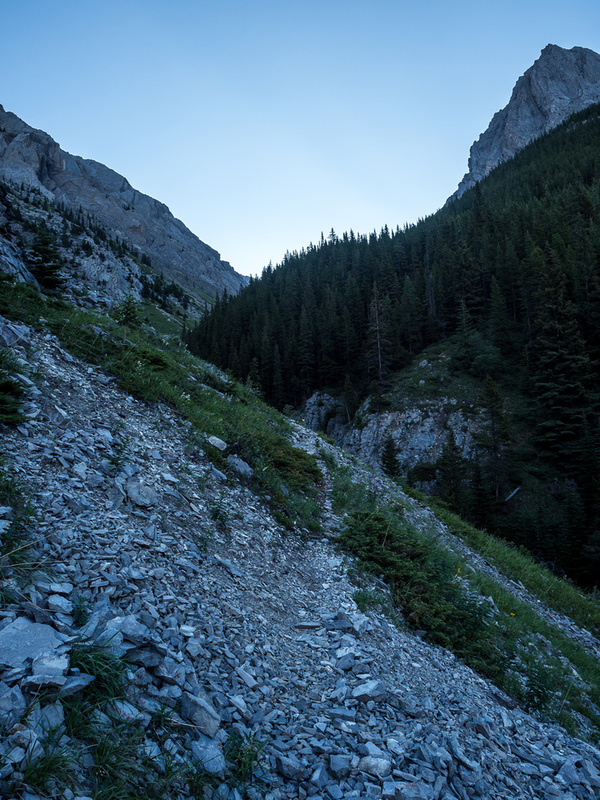 Nice and cool in the early morning as I ascend the steep and direct Grizzly Creek Trail. 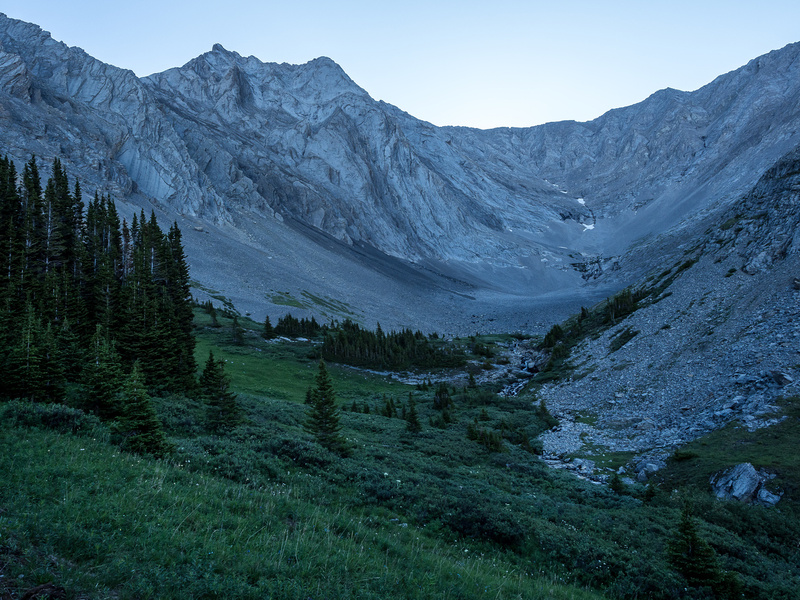 Instead of going up and left, I continue into this lovely valley towards the cirque between Evan Thomas (R) and Potts (L). The two cliff bands are moderate scrambling but do require a bit of route finding. Looking back over the cirque I'm surprised how much height I've gained already. As I start up the gully, I notice that I'm higher than Opal South (R) and even higher now than Lawson Ridge! Note the light brown crumbly rock abutting the "solid" (it's not that solid) gray rock at right. Looking down the lower gully - you can see it's actually quite fun and slabby here. The terrain on either side is steep, loose and downsloping. Now this sucker is getting steep. Looking the other way now - towards the summit. 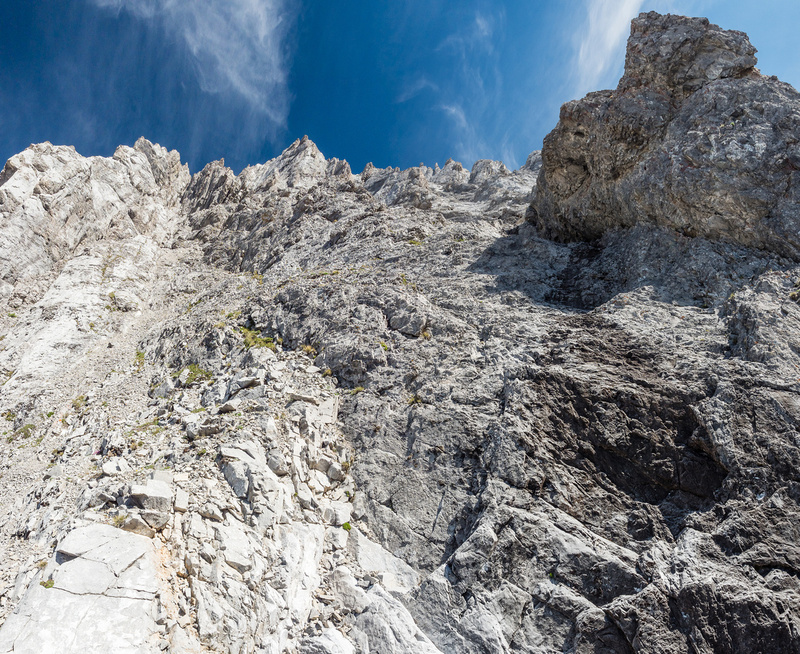 This is one of the fun traverses on a good chunk of slab with some serious exposure to the right. Looking back at a section of ridge I just downclimbed. Another section of ridge I downclimbed on route to the summit. 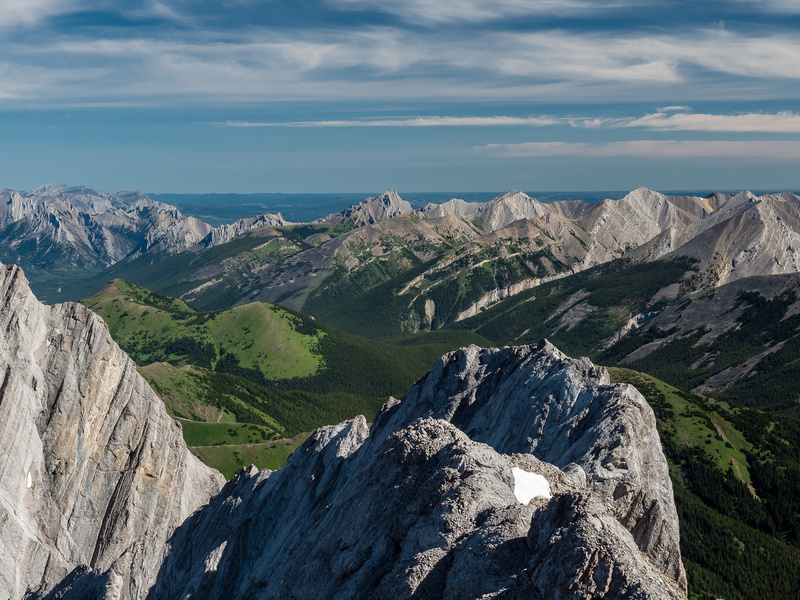 Kananaskis and Spray Lakes peaks including Lawson Ridge and summit at center and many others beyond. 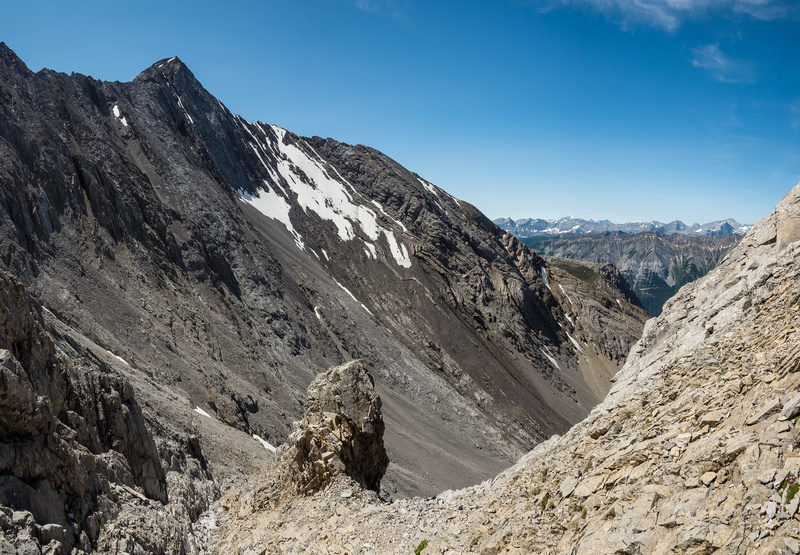 Mount Denny at right here with Opal Ridge running off to the right from mid center. 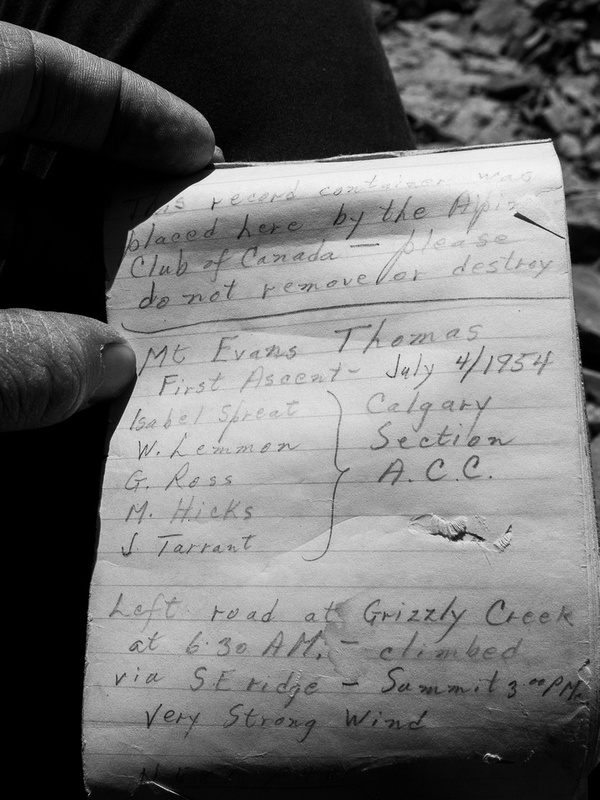 Pretty cool to see a register this old - even if they thought they were on the wrong mountain! 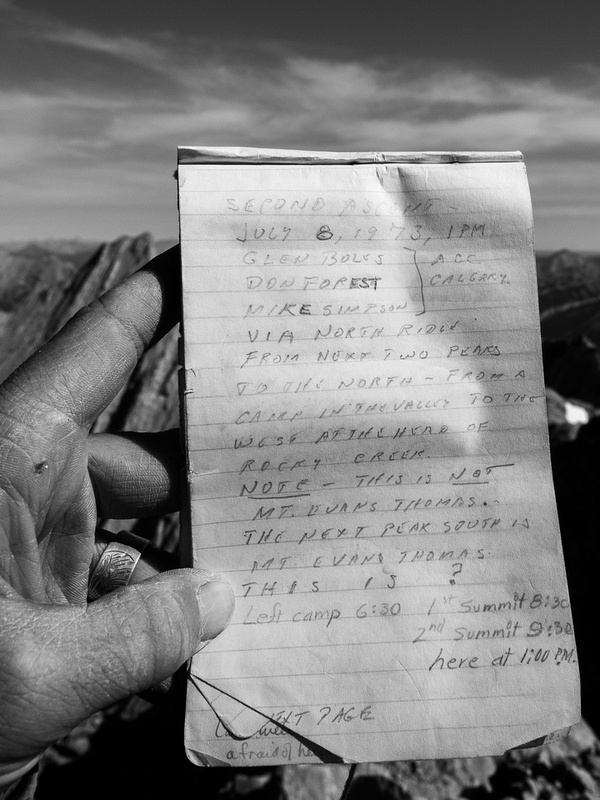 Very rare to see names like "Don Forest" in summit registers nowadays. Evan Thomas "East" peak with Glasgow and Cornwall in the distance. 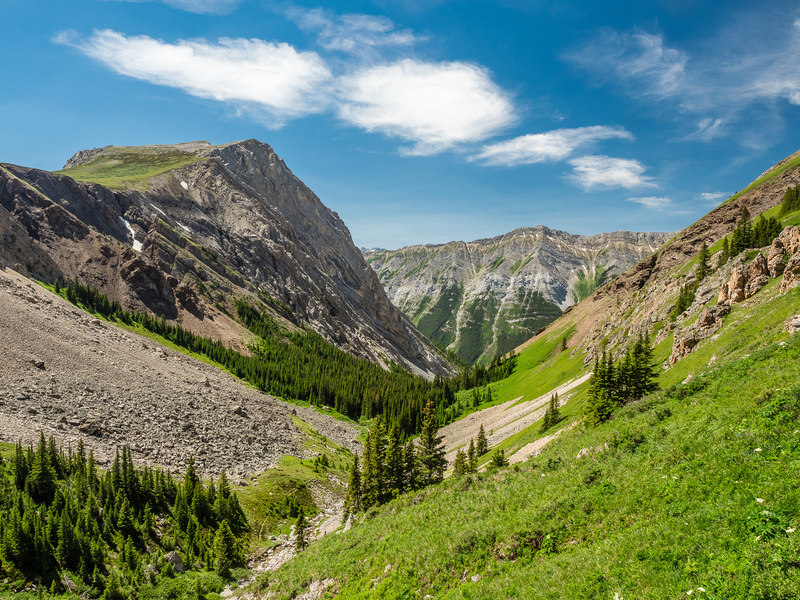 The very lush looking Evan Thomas Creek Valley with peaks such as Old Baldy and McDougall visible. 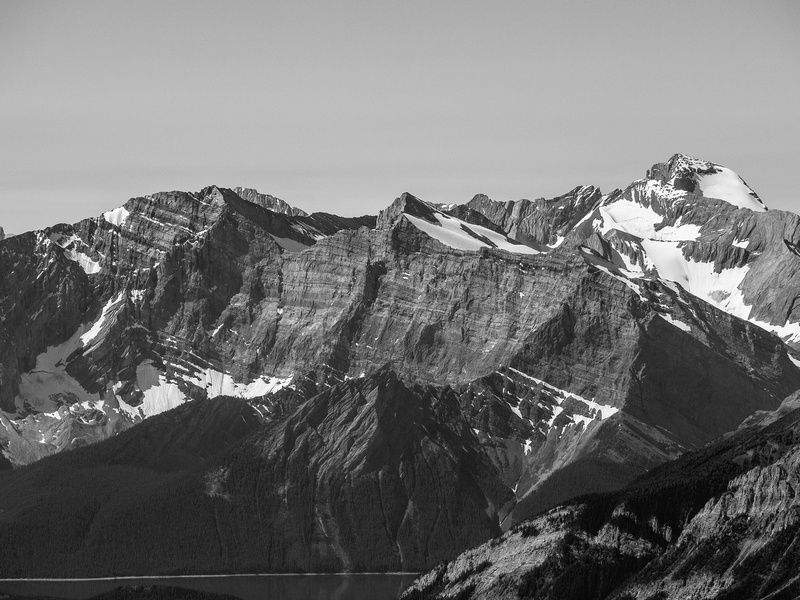 The Mount Kidd massif with Bogart, Sparrowhawk and Lougheed in the distance. Inflexible (L) and James Walker (R) with Assiniboine, Eon and Aye rising in the far distance. Aster Lake peaks include (L to R), Marlborough, Joffre, Mangin, Cordonnier and Lyautey. Foch and Sarrail are in front of Joffre and Marlborough. 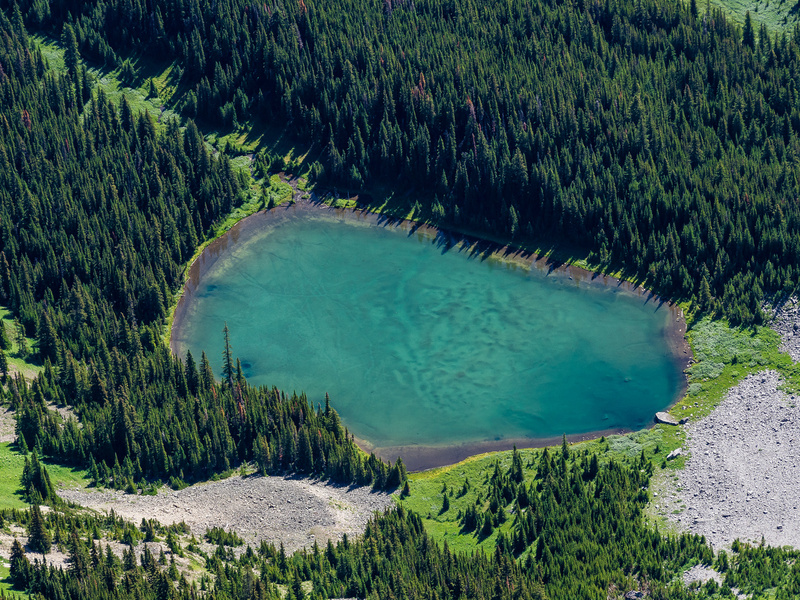 A vibrant tarn sits under the east face of the Opal Range. An unusual view of Mount Romulus. A section of ridge on return. This is my gully. You can even see the slightly browner rocks at right already at the top of the gully. Also note how bloody unconsolidated everything is! Fearfully glancing up behind me as I try to get the heck out of this terrain trap. The pinnacle ahead of me here is a nice landmark feature. Evan Thomas rising beyond. That is a long way up! This the view once you clear the second headwall and look immediately left. 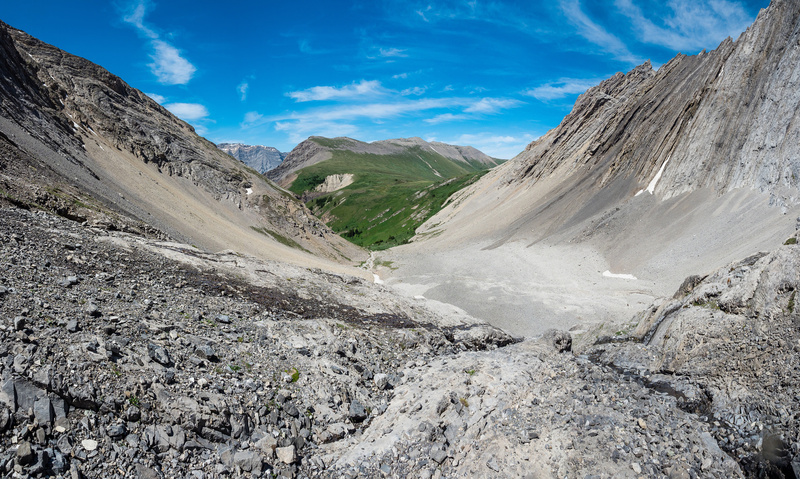 Note the long, continuous brownish gully that rises all the way to the ridge above. This is the top of the second headwall with a nice key landmark feature at right. The ascent gully is just not visible yet at left here. 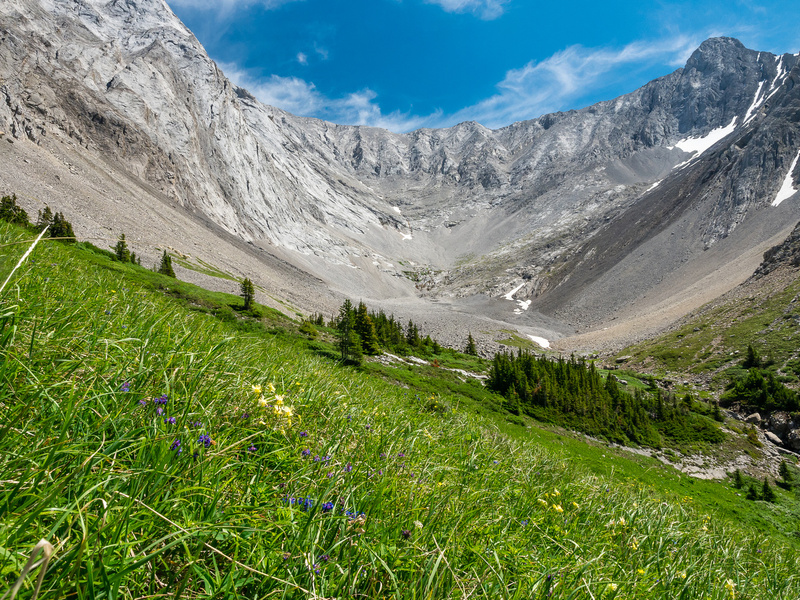 Descending back into the lovely cirque and upper meadows of Grizzly Creek. 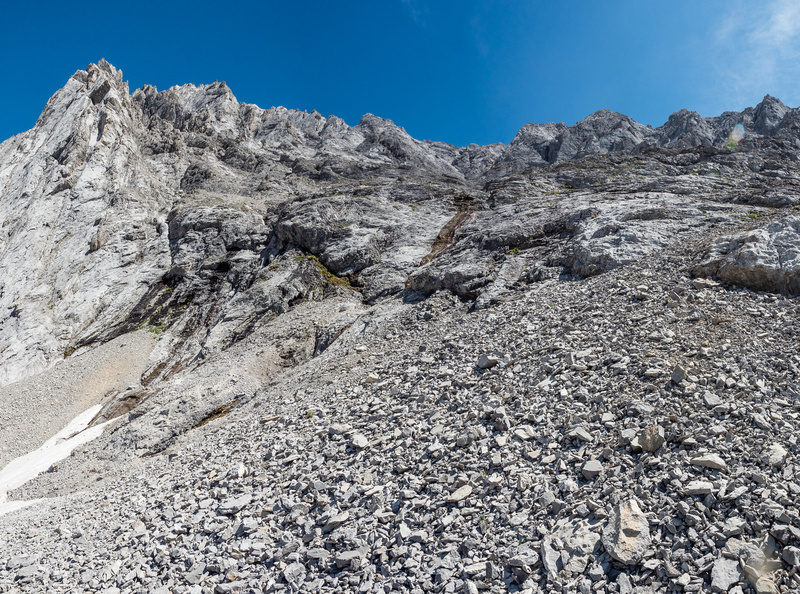 Another view up the headwall. 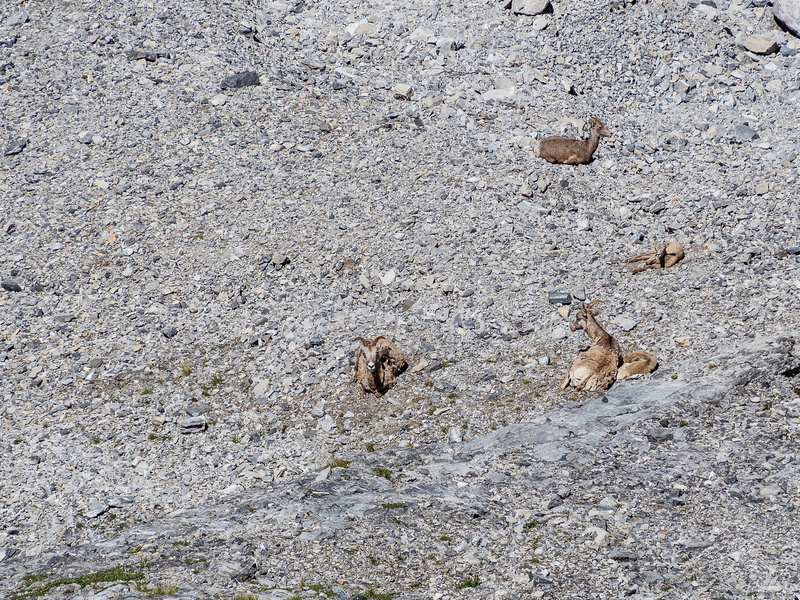 I detoured a bit so as not to disturb these sheep who looked very chill in the upper cirque. Views off the top of the first headwall looking down valley. Back in the land of green and flowers! Grizzly Creek never looked so good - the water was very refreshing in the hot sun. 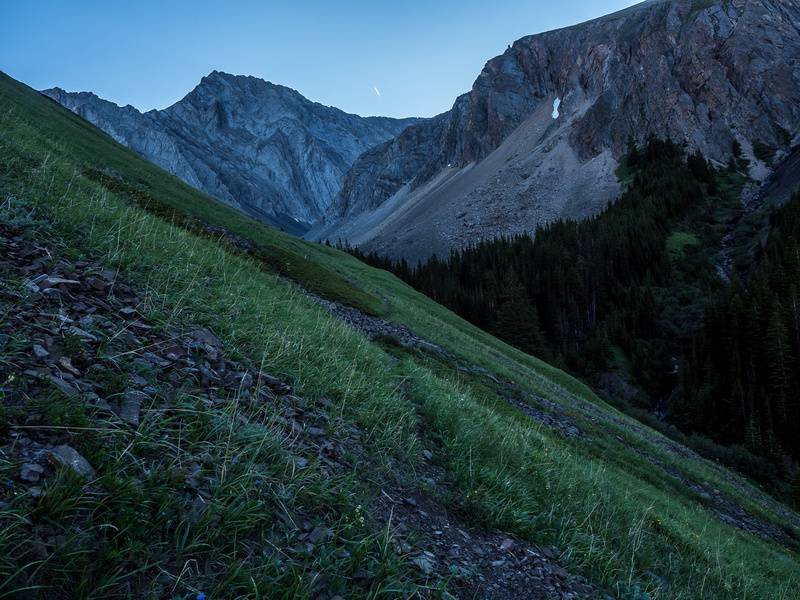 Taking a nice break in the meadows, looking back at the cirque and the two headwalls. An easy, but hot hike out. Grizzly Peak at left. 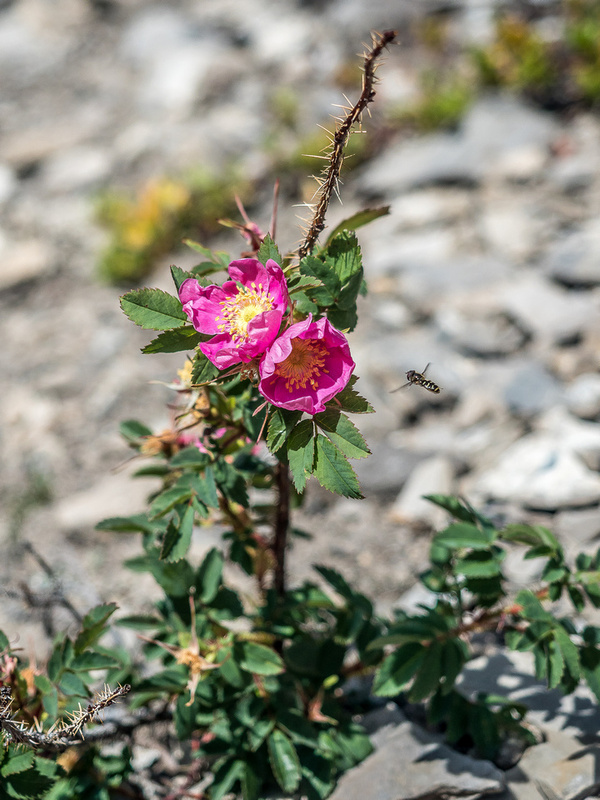 Alberta's flower with a local resident honing in on the fresh blooms.